Are you looking for an ideal phone messaging system to keep your personal and business contacts separate? Here’s some good news for you. With 2nd phone number app App experience an ideal phone messaging and calling system for your business. Choose a number for any area code of your choice and start messaging and calling. 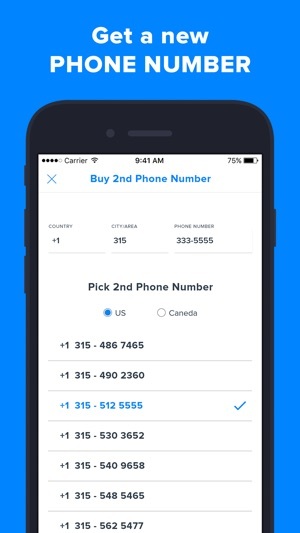 2nd phone number app App provides an alternate number that works flawlessly on iPhone. It turns your mobile device(s) into a full-featured business phone. •	You can choose any number for a specific area code. Call or send message to anyone residing in cities across the U.S. or Canada. 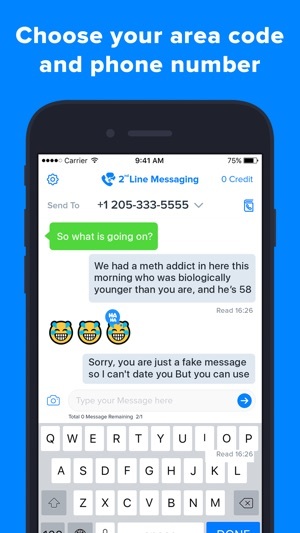 •	2nd phone number app lets you send pictures in the messages. 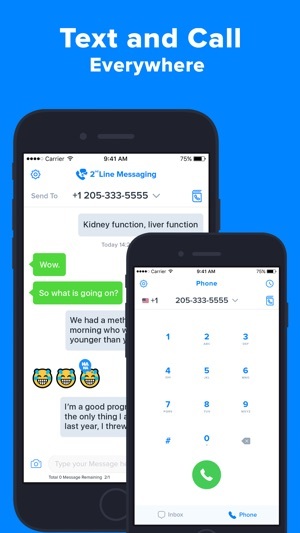 And not only that you can add several people on the messaging list and start group messaging. 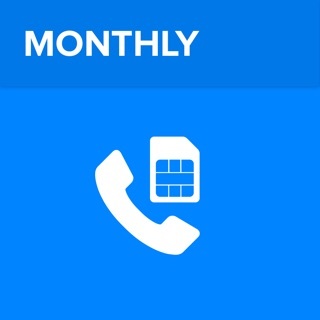 • To buy one phone number: Auto-renewal (Monthly $9.99 or Year $49.99) begins after 3 days of free trial. • Any unused portion of a free trial period, if offered, will be forfeited when the user purchases a subscription to that publication, where applicable 2nd phone number app adds the great features above and are available through an auto-renewing subscription. Subscriptions will be charged to your credit card through your iTunes account. Your subscription will automatically renew unless cancelled at least 24 hours before the end of your current subscription, and you can cancel a subscription during the active period. You can manage your subscription at any time, either by viewing your account in iTunes from your Mac or PC, or Account Settings on your device after purchase. Disclaimer: All 2nd phone number app users will be required to sign up for an auto-renewable In-app purchase before they are able to access the app. - Would you mind writing us a review and telling us what features you'd like to see in the app? I was charged 9.99 . It worked for one day. I checked for updates ... there was none. No number to call to get support . The next day I tried to text ... kept saying invalid number . Which makes no sense since it was saved from the day before . I tried calling and it kept doing the same thing and closing the call screen . Definitely do not use this app. Now I have to try to get my money back. This is rediculous . App doesn’t alert you when receiving a call- useless! App downloaded fine and I was able to make outgoing calls. However, when I received a call my phone screen was still blank and my new iPhone X just vibrated. 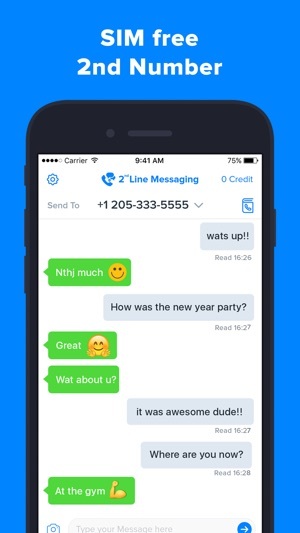 The only way to know or see the number that was calling was to launch the 2nd line app. Can’t you make it so that it appears on your screen like a regular call? Cancelled my trial subscription due to this fact. We want to sincerely apologize for your bad experience within the app. Please update the app to its latest version. We have fixed the issue with the outgoing calls but we can’t make the screen appear same as a regular call as it’s against Apple’s policy. However, we'd like to learn more about your situation. We want to make things right. So, please email us at 2ndphonenumber@gmail.com and we will get back to you promptly. Thanks - 2nd Phone Number team. You will get asked to write a review before you even use the app. I signed up and purchased the subscription for a month with the 3 trial. Then proceeded to set up my fake phone number. Couldn’t get any farther because after selecting my number it simply had a loading animation and nothing more. Don’t ask for money if the product won’t even work on its own!